Hideyo Amamoto plays Dr. Who (Yeah I know...) has been hired by Madame X (Mie Hama), an agent of an unnamed country, to procure the dangerous Element X. Dr. Who decides that having a huge robot gorilla tunnel its way through the Earth is the best way to go about doing this. MechaniKong proves no match for the magnetic field around Element X and shuts down. Luckily, a UN submarine, led by Commander Carl Nelson (Rhodes Reason) just happens to land on an island that is home to the real King Kong. Once Who and X get wind of that, they capture the giant ape with some sleeping-gas bombs and helicopters. They mind control Kong with some flashing lights and set him to continuing the excavation. The hypnotic suggestion fades and he escapes. Dr. Who is forced to send MechiKong after the real Kong, who has fled to where else? Tokyo. 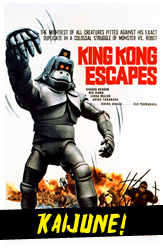 King Kong Escapes is loosely tied to a Rankin and Bass King Kong cartoon from the same era. This fact coupled with the presence of a robot Kong, and a flamboyant villain, would seem to be setting up for something extremely silly. Wisely, the film takes all of these elements and plays them with a straight face. This mature treatment of the story really goes a long way to making it a believable drama (well believable-ish, I mean we are still talking about a giant ape and its robot doppelganger beating the snot out of each other in downtown Tokyo). Another aspect I enjoyed was the fact that the monsters are introduced early and used often, creating a unique energy in the occasionally sluggish kaiju genre. Although our heroes are the kind of stand-up do-gooders that don’t leave much of an impression, Dr. Who and Madame X are a lot of fun to watch, and it's hard not to root for them just a little bit. While we're on the subject, Dr. Who seems at least somewhat inspired by his BBC counterpart. He sports a hat and cape not dissimilar from William Hartnell's portrayal of the Doctor. The fact that another character is named Susan (Linda Miller) is probably no coincidence either. Probably the biggest let down is the King Kong suit itself. The most successful looking kaiju tend to be reptiles, insects and robots. These things, by and large, have inexpressive faces and communicate mostly through body language. Gorillas are different, they are similar enough to humans that we can read emotion on their faces. King Kong’s stiff face looks strange and lumpy, even the 1933 stop-motion original had more emotive power. The MechaniKong suit is much more effective, its blank face carries with it a certain menace that sells it as a threat. Most interesting, is how well this film retains elements of the original 'King Kong'. The opening act is a mini-retelling of the initial discovery of Kong from the ’33 version, Both Kong and MechaniKong take turns carrying poor Susan around, and the finale even takes place as the Kongs battle while climbing a tower. King Kong is presented as a misunderstood monster, not a nigh-indestructible tank stomping nightmare like a lot of his Toho brethren. King Kong Escapes is a well crafted film and despite its kid's cartoon origins, doesn’t pander or wallow in (too much) silliness. It’s too bad Toho couldn’t retain the rights for very long, the Kong films could have been another great series for them.